Day 4 of My Selangor Story 2013 (MSS2013) programme was the day when we went back to nature. 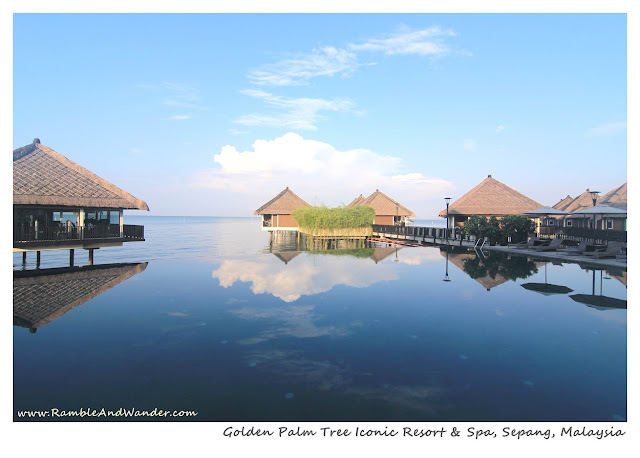 We started the day by having some (supposedly) light breakfast by the infinity pool at Golden Palm Tree Iconic Resort & Spa. “Light breakfast” because we’re going to have a basic yoga session at 8.30 a.m. at the spa on the first floor of the Club House and we were supposed to stop eating about 1 hour before the session. What was harder to ignore however was the real blue sky and the reflection that we got from the infinity pool. It's just unbelievably beautiful. Yoga session was fun. We sat, lied down, stood in positions never tried before. Didn’t even know that our (read: my) body is that flexible. The instructor was a hit among the girls. The guys meanwhile felt like our body has been hit, pulled, stretched and punched after the session finished. Well, actually I don’t know about other guys but at least that’s what I felt. It felt good nevertheless. And we were all ready to get on with our next activity, cycling around the village.